the fash pack: the killers are gonna kill it in manila! Tickets available at all Ticketworld and Ticketnet outlets. SRO. For 2010’s major event, two of the biggest names in the industry converge to bring music lovers and aficionados another rocking experience. WORLD WIDE WOMB, spearheaded by Stephen Ku—producer of much successful big room events and SAGA EVENTS, spearheaded by Robby Carmona—country’s renowned fashion director. 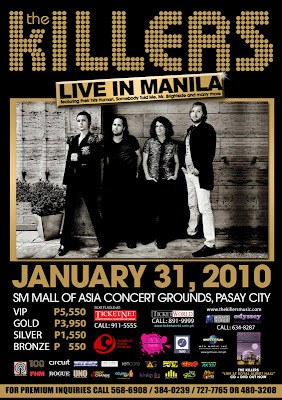 The event is slated on January 31, 2010 at the Mall of Asia Concert Grounds. 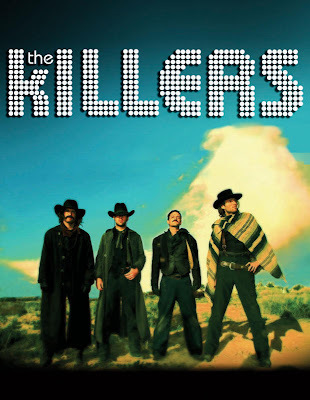 Together, they’re bringing to Manila, the famed rock group from Las Vegas, USA—The Killers. Known especially for their hit tracks “Mr. Brightside” and “Human”, their latest single “A White Demon Love Song” is a part of the original soundtrack of New Moon—sequel to the Twilight saga. It was late 2002. Brandon Flowers (yes, it is his real name) had been dumped by his one previous group, a synth-pop outfit named Blush Response, when he refused to move with the rest of the band to L.A. Cruelly ditched, but inspired by seeing Oasis play (incredibly, the Brothers Grim had made it all the way to Vegas in one piece) he saw that his life needed more guitars. When he clocked Dave Keuning’s small ad in a local paper naming that band as an influence and what with Oasis not exactly factoring in the pasty Vegas music scene, he took it as fate that they should be together. ''He was the only person to reply to my ad who wasn't a complete freak", remembers Dave fondly. "He came over with his keyboard and we started going through song ideas straight away. I had the verse to ‘Mr. Brightside’ and he went away and wrote the chorus. That was the first song we wrote together and remains the only song that we've played at every single Killers show". So far, so romantic then. The early core of the band was cemented and their amazingly previously unused moniker appropriated from a New Order video. The premise of said promo was to represent the perfect band with the greatest song as well as model good looks and youth on their side—to represent Barney & Co.
After trying out a couple of different bass players and drummers, Brandon and Dave met Ronnie Vannucci, a photographer at the Little Chapel of Flowers and student of classical percussion at UNLV, and Mark Stoermer, who was making ends meet as a medical courier (blood, urine, the odd body part, all glamour). In between these couldn't-make-it-up day-jobs (Brandon, for the record, was a bellhop at the Gold Coast Hotel; whilst Dave garnered valuable training for his current all-the-ladies-love-an-axeman dilemmas whilst enjoying trysts with lady shoppers at his Banana Republic job) the newly complete Killers set to writing what we can assuredly state to be one of the most exciting debut albums you'll have heard in a very, very long time. Word soon spread further afield about The Killers. The band came to the attention of London-based independent label Lizard King, and they made their way over to the UK for their first ever gigs outside of Las Vegas (for some of the band this was even the first time they’d needed a passport) and a limited-edition release of "Mr Brightside" in September 2003. Those lucky enough to catch these first London shows came away pretty much unanimously enamoured ("A head-mashingly brilliant arsenal of tunes. Right now few bands are a safer bet than The Killers", glowed NME), while the group's subsequent appearance at New York industry fiesta CMJ in October saw a swarm-sized buzz surround the band and a worldwide (ex-UK) deal inked with Island Records. Were Young” and “Bones”. The band then released a compilation album Sawdust, which offers a mishmash of covers and collaborations. 2008 saw the much-anticipated Day & Age, The Killer's third studio album, hit the shelves. The Killers were back to their best, with a strong and creative record. The quirky lyrics of the first single from the album, “Human”, had everyone rushing to find out about the journalist Hunter Thompson; Brandon Flowers mentioned he was the inspiration for the “Are we dancers” line. 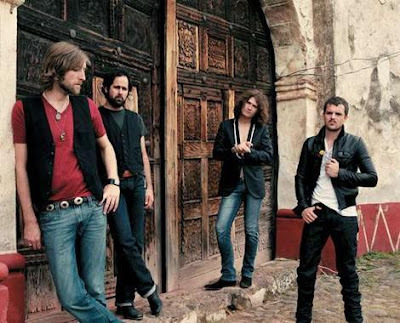 This year, The Killers joined the much-anticipated New Moon soundtrack with the song “A White Demon Love Song”, the all-original, all-exclusive soundtrack has been raking the charts and album sales.